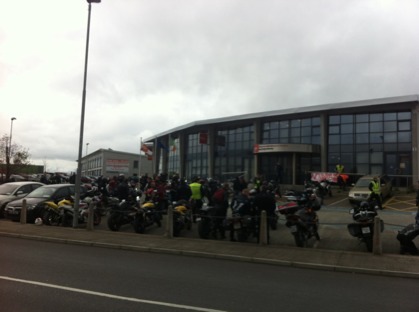 An estimated 60 bikes decended on the RSA offices in Ballina on Friday 29th October 2011 to vividly demonstrate their opposition to the RSA’s proposals for mandatory high visibility clothing. The RSA’s Noel Brett met with a delegation of the bikers present and the meeting was described as cordial. MAG Ireland commends all those who took part for their commitment and positive example that they set. A MAG Ireland rep was in attendance on the day and was vocal in his praise for the participants. MAG has arranged a formal meeting with Noel Brett in November to discuss issues arising out of the National Motorcycle Safety Action Plan including the mandatory high visibility issue. MAG Ireland extends our gratitude to the organisers & all who took part. Well done to all involved on the day for delivering the message to the RSA in the most visible way possible. There are regional meetups to ride to Ballina being organised, for now the meet point is the merry monk pub on the killala road for 12.30, then to RSA headquarters together for 1pm. Our plan so far is to bring letters articulating out objections to MHV and have them signed by as many people as we can get. Some regional meetup points & times have been more or less established, list below. Google map also to illustrate. Organiser contact: e-mail: arthurlewis.com@gmail.com or mobile 087 263 3118. MAG Ireland will add any additional information received regarding meeting up points and times to this post. Note: MAG Ireland would urge anyone taking part to be fully aware of the proposals, not just for high visibility clothing, but also the other RSA proposals in the National Motorcycle Safety Action Plan 2010 – 2014. Disclaimer: While MAG Ireland is happy to support this protest, please note that this is not a MAG Ireland organised demo, and we are posting this information purely for the benefit of anyone who might want to take part. Please contact the organisers directly with any queries – e-mail: arthurlewis.com@gmail.com or mobile 087 263 3118.